The Institute of Cancer Research (ICR) and the Royal Marsden NHS Foundation Trust (RM) are committed to the early and optimal development of rationally designed, novel anti-cancer drugs, to ensure the maximal likelihood of patient benefit, strategically targeting molecular abnormalities and key cellular switches hijacked by cancer cells. The joint organisation is internationally at the forefront of cancer research with a particular interest in not only understanding how cancer cells acquire genomic mutations, which can confer resistance to treatments, but crucially studying through both laboratory and clinical studies how to maximise selective tumour cell kill through novel and combinatorial treatment strategies. Our multidisciplinary team is dedicated to conducting biomarker enriched clinical trials, pursuing proof of mechanism and proof of concept studies, exploring pharmacokinetic and pharmacodynamic biomarkers to ensure we optimise drug dosing and scheduling to maximise the likelihood of drug tolerability and patient benefit. Our clinical trials also pursue predictive biomarker studies using next generation sequencing of tumour material acquired from biopsies or blood samples to identify as early as possible in clinical development which patient population the drug or drug combination can benefit. Finally, we are also focused on developing circulating, and imaging utilising MRI and PET, biomarkers to identify treatment response or resistance as early as possible. The ICR ECMC works very closely with other ECMCs to conduct early phase clinical trials and has run Phase I trials with virtually every other ECMC in the UK. The ICR also has a dedicated paediatric Drug Development Centre. We also have a dedicated team pursuing radiation combination studies. To conduct early-phase clinical trials focused on translating our understanding of cancer biology to improved patient care as rapidly as possible, in collaboration with other ECMC Centres. To develop anticancer drugs designed and synthesised at The Institute of Cancer Research, maximising their potential to impact the care of cancer patients. To establish novel methodologies that can accelerate the anticancer drug development process, and minimise the risk of costly late failure, by supporting the optimal conduct of biomarker-driven early clinical trials focused on defining tolerability, proof of mechanism and proof of concept. To generate an improved understanding of cancer biology through translational clinical research, to support iterative and rational collaboration between laboratory and clinical researchers that can identify mechanisms of treatment resistance, and novel druggable targets for future drug discovery. Professor Johann de Bono is a Professor in Experimental Cancer Medicine at The Institute of Cancer Research and Royal Marsden. He is the Director of The Drug Development Unit, overseeing the conduct of Phase I trials, with a particular interest in innovative trial designs, circulating biomarkers and prostate cancer. He leads the Prostate Cancer Targeted Therapy Clinical Trials Team and the Cancer Biomarkers laboratory team. Professor de Bono has served as chief investigator of several drugs that have changed the standard of care for prostate cancer patients. His team has been involved in the development of many novel agents, many of which are now approved drugs, including abiraterone, olaparib and afatinib. To see Professor Johann de Bono's full profile, click here. Dr Marshall is a Consultant in Paediatric and Adolescent Oncology Drug Development, as well as being the Phase I/II Paediatric Solid Tumour Lead. The Royal Marsden (RM)’s 31-bed Oak Centre for Children and Young People opened at the Sutton site in September 2011 following a substantial £20 million new build, and is one of the largest comprehensive cancer centres for children and teenagers in Europe. Almost 600 inpatients and more than 5,000 day patients are seen at the Oak Centre every year. There are approximately 220 new malignant registrations in children and adolescents per year, including of leukaemia, central nervous system and extracranial solid tumours. Patients are referred to the Centre from south of the Thames, Kent and the south coast, although for early phase clinical studies patients are referred from all around the UK via clearly defined referral networks, with at least a third of patients recruited to paediatric early phase studies coming from out of region. Our Centre runs the largest Paediatric and Adolescent Drug Development Programme in the UK and one of the largest in Europe and internationally. We have been formally designated by the Innovative Therapies for Children with Cancer (ITCC) European Early Phase Clinical Trials Consortium as a First-In–Child Study Centre. Investigators from our Paediatric and Adolescent Drug Development Unit are currently leading and involved in multi-centre national and international trials evaluating new therapeutic strategies, including trials of molecularly targeted agents and immunotherapies. The Research activities of the RM Paediatric/Teenage and Young Adult (TYA) Clinical Unit (Head – Dr Julia Chisholm) and the Paediatric and Adolescent Drug Development Team are closely integrated with the Divisions of Cancer Therapeutics and Clinical Studies at The Institute of Cancer Research (ICR). Following the recent retirement of Prof Andy Pearson, the international recruitment process for his successor as ICR/RM Professor of Paediatric Oncology Drug Development and Academic Lead is currently underway. The joint ICR/RM Centre’s comprehensive Paediatric and Adolescent Oncology Targeted Drug Development Programme comprises drug discovery, pre-clinical evaluation, early clinical trials and the Oak Foundation clinical facility. The clinical facility includes 18 children’s inpatient beds, a dedicated 13 bed TYA Cancer unit, outpatient chairs and day care beds for both children and TYA patients, (including those on Phase I/II clinical trials), together with an adjacent on site laboratory for pharmacokinetic and pharmacodynamic sample processing, and two suites for radioisotope therapy to help facilitate novel studies involving radioisotope components eg MIBG therapy. We are one of very few European centres with the facilities and expertise to run functional imaging biomarker studies within the context of Paediatric/TYA early clinical studies. To increase the number of hypothesis-driven, first-in-child early phase clinical studies of molecularly targeted anticancer agents with embedded predictive and pharmacodynamic biomarkers, initiated and led by the RM/ICR Paediatric and Adolescent Drug Development Team. To develop functional imaging approaches for incorporation into early clinical trials of molecularly targeted agents for childhood cancers. To increase the number of children and young people in early clinical studies. Over the past 9 years, investment by the Oak Foundation and other key sources such as the ECMC and NIHR Biomedical Research centre (BRC) has facilitated the development of a strong Paediatric and Adolescent Drug Development Team with knowledge and expertise in the field of drug development, and provided crucial infrastructure for the successful running of early clinical trials, in partnership with international academic networks major and pharma companies. The team includes Paediatric and Adolescent Drug Development Consultants (integrated closely with the wider Consultant team within the Children & Young People’s Unit, who provide additional disease-specific expertise and who are chief investigators on international clinical trials themselves), Drug Development Fellows, Research Nurses, Trial Co-ordinators, Data Managers, and Tissue Collectors. The Team also integrates closely with translational scientists with extensive international research experience. This supporting infrastructure has allowed the Paediatric and Adolescent early phase clinical trials portfolio to increase from just 2 open studies in 2006 to 26 open studies in 2015-16 (18 phase I, 8 phase II; 18 molecularly targeted agents; 15 first in child), with further new studies opening this year. This is the largest portfolio of paediatric early phase trials in the UK and one of the largest in Europe. An important achievement has been to ensure as broad an early phase trial portfolio as possible to provide access to new drugs and thus additional therapeutic options to as many paediatric/adolescent patients as have need of them and choose to be enrolled. Our Centre has a well-balanced trial portfolio, with early clinical studies available across the disease spectrum: leukaemias and lymphomas, solid tumours and central nervous system (brain and spinal) tumours, with a balance between trials with broad inclusion criteria and those requiring specific molecular pre-selection, and a balance between oral drugs (often more outpatient-based regimens) and intravenously administered agents (which may require inpatient admissions or longer day care administration times). We run trials of chemotherapeutic regimens, trials of molecularly targeted agents, and immunotherapy trials. Additionally, we have trials for patients across the wide paediatric/TYA age spectrum, with a balance of phase I and II studies, and a balance between pharma-sponsored and academic-sponsored studies. Help accelerate the development of new drugs for children and young people by taking leading roles in international working groups influencing the regulatory landscape of new medicines development. BEACON-Neuroblastoma Phase II: Enormous progress has been made in the academic-sponsored BEACON-Neuroblastoma phase II trial designed and led by RM/ICR investigators and the first randomised trial for patients with relapsed neuroblastoma in Europe. The study is now open in 27 sites across 9 European countries and has been recognised by SIOPEN (the European clinical and research network for neuroblastoma) as the official trial for patients with relapsed neuroblastoma. Overall 160 patients are being enrolled and the trial is recruiting well. Importantly, it is one of the first adaptively designed early phase trials, which will efficiently answer multiple important research questions concurrently: the optimal choice of backbone chemotherapy to which novel agents can be added, and whether the first novel agent tested in the study (Bevacizumab) has a role to play in improving outcomes. This adaptive design has already allowed a third new potential backbone regimen to be added based on emerging data in the scientific community, and the next choice of novel agents to add are formally under discussion within the SIOPEN committees. The Bevacizumab research question will be answered in 2016 and the backbone regimen question in 2017, with the likelihood of the most promising arms being moved forward into frontline treatment. The BEACON 2 study (based on the results of this original BEACON study) is already in planning as a multi-arm, multi-stage (MAMS) adaptively designed trial for testing further novel agents, to ensure there that all patients who relapse can access a relevant clinical trial. The international co-ordinating sponsor of the BEACON-Neuroblastoma study is the CRUK Clinical trials Unit in Birmingham, and it has attracted significant international charity funding. LDK378 (Ceritinib) Phase I: (Sponsor: Novartis). This international first-in-child, predictive biomarker-driven study of an ALK inhibitor was developed jointly with the RM, one of just two UK sites, and we are a lead recruiting site internationally. The study is open to patients whose tumours have genetic aberrations in the ALK gene. The phase I dose escalation and food effect parts of the study have recently been completed and the study has move to further cohorts at the disease-specific recommended doses for expansion/phase II phase. PD1-PD-L1 Immune Checkpoint Inhibitor Studies: The international Merck-sponsored Pembrolizumab Phase I/II study and the Roche-Genentech-sponsored Atezolizumab Phase I/II study both opened at RM/ICR (the UK lead site for both studies) in late 2015 and are recruiting very well, to time and target. These very promising immunotherapy agents are being studied in children and adolescents with a variety of solid tumour types including lymphomas. Tumour Profiling Study – next Generation Sequencing Pilot Study: This ICR/RM pilot study of a molecular profiling initiative has recently opened and is based on a next-generation sequencing (NGS) panel of 80 genetic aberrations mutated in cancers that was developed at The ICR/RM. The hope is that the profiling will help find ‘actionable mutations’ driving paediatric cancers and potentially help guide future patient treatment. A Phase I trial of AZD2014 and paclitaxel (TAX-TORC) is an example of how the infrastructure and support from ECMC were utilised in early phase studies, & expediting the transition to Phase II study. The Phase-I trials were successful and went into expansion on ovarian and squamous Lung carcinoma eventually leading to development of Phase II, randomised trial in ovarian cancer. The Phase I trial was conducted by Investigator Initiated Studies Team at the ICR Centre. The infrastructure developed with ECMC support has enabled this cutting edge early phase trial to be fast tracked and progress to next stages. The results from the Phase I trial were presented at the AACR Clinical Plenary session in April 2015. The TAX-TORC study is Phase I trial of the combination of AZD2014 (dual mTORC1 and mTORC2 inhibitor) and weekly paclitaxel in patients with solid tumours. The study is led by Dr.Udai Banerji, to assess the safety and tolerability of the combination drugs. With a unique potential for treating large numbers of patients with diverse tumour types and extensive experience in delivering phase I oncology trials, the Drug Development Unit within ICR & RMH is ideally placed to evaluate a broad spectrum of novel anti-cancer agents. It comprises of a large and well-defined multi-professional research. The Phase 1 Clinical Facility, The Oak Foundation Drug Development Unit, housed within The Royal Marsden, is a purpose-designed Unit to run phase 1 clinical trials. 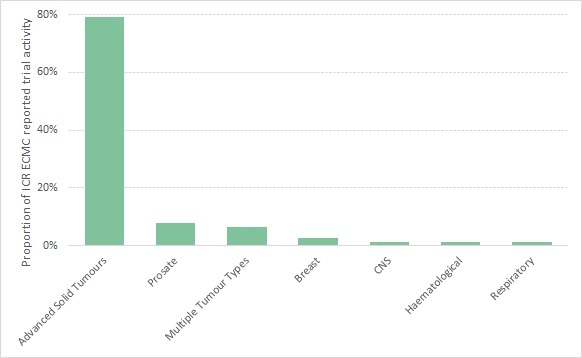 The Unit possesses capabilities to conduct a large number of investigator initiated and/or externally sponsored first in man oncology studies at any given time. It provides ten inpatient beds, five treatment chairs and two outpatient suites. The Unit delivers services to patients and sponsors compliant with the highest safety and quality standards required for phase I trials. These clinical and laboratory platforms provide a seamless pathway for truly translational drug development programmes focused on improving the treatment and outcome of cancer in adults. ECMC funding provides infrastructure support for early phase and translational research at our Centre. The Centre at ICR exploits its unique infrastructure and capabilities to sponsor (RM/ICR co-sponsorship), design, execute and report biomarker-driven, early phase trials through our investigator-initiated trials (IIT) team. The team works in collaboration with commercial and academic partners to take forward promising novel therapies or therapy combinations which would otherwise not progress and address unmet medical needs. IITs are conducted in partnership with the ICR Clinical Trials and Statistics Unit (CTSU), an academic United Kingdom Clinical Research Collaboration registered Clinical Trials Unit (CTU) and one of 15 CTUs recognised by the National Cancer Research Institute as having expertise in the development and delivery of cancer trials. ICR-CTSU provides trial database development and maintenance together with other trial administration systems (including pharmacovigilance), statistical programming and analysis. The DDU IIT team is comprised of skilled clinical research professionals to support all trials from initial discussions of trial concept, through to design and development, regulatory submissions, day-to-day management, analysis and reporting, and the timely delivery of high quality ICH-GCP compliant studies. ICR Clinical PD Biomarker Group develops, validates and implements fit-for-purpose assays for evaluation of Pharmacodynamic Biomarkers in early clinical trials of new oncology agents. The group specialises in measuring PD Biomarkers, especially phosphoproteins, in less invasive surrogate tissues such as platelets, PBMCs and hair follicles, plus tumour biopsies, using immunoassays including ELISA, MSD®, Luminex® and immunofluorescence, validated to MHRA Good Clinical Practice (GCP) for clinical laboratories standards. Validated assays include AKT/PI3K/MTOR, PKA, HSP90, ROCK, and IGF signalling and histone deacetylase and MycN biomarkers. Assays under validation include cell cycle checkpoints, DNA damage response and ALK, Aurora and FLT3 signalling biomarkers. The Group’s PD monitoring has proved highly valuable in over 35 early clinical trials. Surrogate patient tissues combined with robust, quantifiable assays have measured the extent and duration of on-target effects, evaluated downstream biological effects, provided proof of drug mechanism of action and influenced trial dosing schedules. The group is a crucial member of the multidisciplinary clinical trial team, liaising with project teams to optimise assays prior to trial initiation and engaging in discussions about PD, PK and clinical toxicity/efficacy throughout the trial. The Drug Metabolism and Pharmacokinetics Group develops and validates LCMS methods to measure compounds in biological samples in order to support early clinical studies. In first in human clinical trials, the team establishes that the plasma concentration achieved in man is suitable to achieve biomarker modulation or therapeutic efficacy based on preclinical models. In addition, the team generates PK/PD models in order to achieve optimal scheduling/efficacy. In combination studies, the potential for drug-drug interaction is predicted and tested. Finally, the team measures plasma metabolite as pharmacodynamic biomarkers. The team works to GCP compliance such that the data generated by the group can be used for drug registration. 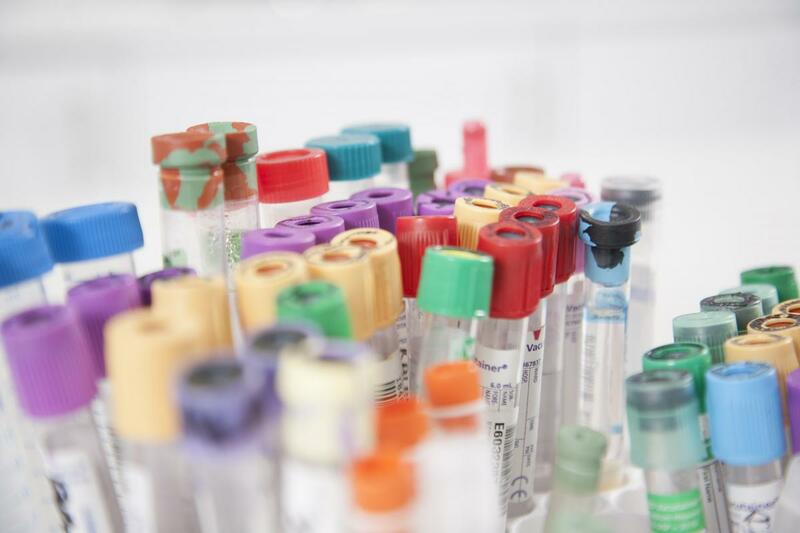 The Cancer Biomarkers Laboratories at the Institute of Cancer Research are focused on circulating biomarkers specifically circulating tumour cells (CTCs), whole blood expression profiling and sequencing of circulating tumour DNA (ctDNA) in plasma. Our CTC facilities include 3 Janssen CellSearch platforms, including one designed for fixing and scanning circulating tumour cells before and after multi-color fluorescent in situ hybridization (FISH). Our sequencing Laboratory has both an Illumina MiSeq and an Ion Torrent PGM. These instruments are used for routine patient tumour tissue and ctDNA sequencing. Our researches have recently developed a number of assays in sequencing ctDNA (Carreira et al. 2014, Perkins et al. 2012). The Cancer Biomarkers Laboratories have a Histopathology subgroup which collects patient biopsy material as well as performing routine histopathology techniques such as sectioning of paraffin embedded tissue blocks, H&E staining and a variety of immunohistochemical (IHC) staining looking at the protein expression of genes of interest within the team. We have an in-house pathologist who is involved in scoring IHC staining amongst other things. ECMC funding provides infrastructure support for early phase and translational research. 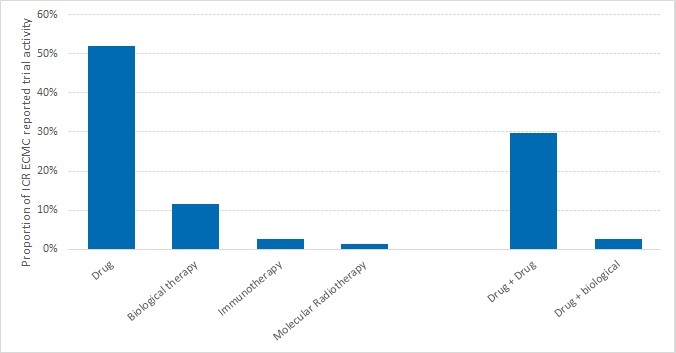 From the ECMC Institute of Cancer Research portfolio, the following trials have been carried out.